Nothing like being front-and-center in the middle of a huge Cabo San Lucas Tournament and the Western Outdoor News Tuna Jackpot is one of the funnest tournaments to be part of. AND THE FINAL WINNING WEIGHT IS…..!!!!!! This has got to be one of my favorite times of the year. 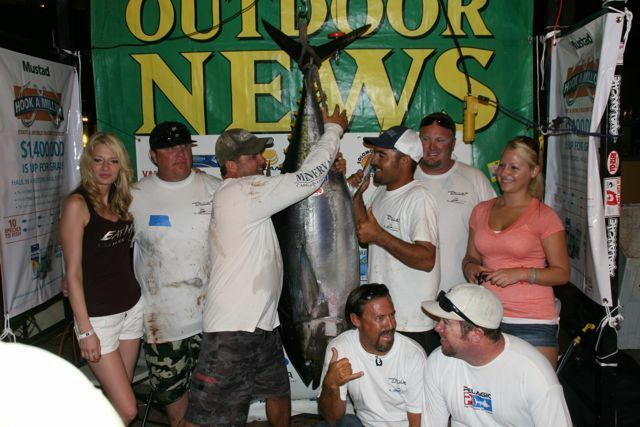 By the time you’re reading this, we’ll be in the middle of the 2012 Western Outdoor News Tuna Jackpot Tournament in Cabo San Lucas. This is maybe the 10th year that we’ve worked at the tournament. The Western Outdoor News Tuna Jackpot Tournament has a special place for me. 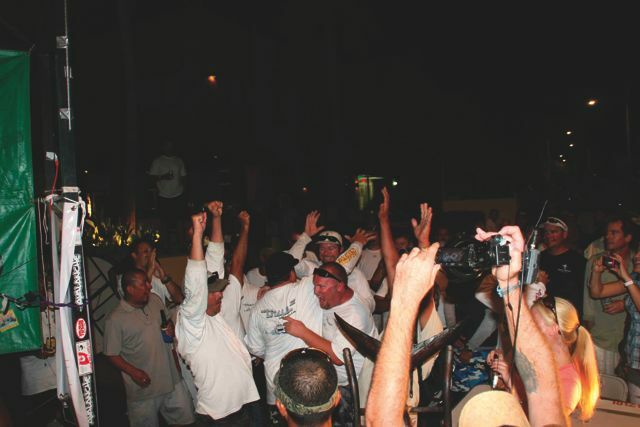 With more than 120 teams possibly this year, if it’s not the largest of the big Cabo San Lucas fishing tournaments, then it’s the “funnest” of the tournaments. It’s the “everyman’s tournament”. Everyone plays. You don’t have to mortage the house or be a millionaire. Everyone passes “GO!” Everyone participates. You’re more likely to run into your neighbor down the street or Joe the Mechanic and his wife from Riverville, Oregon. Probably Rob and Chuck two carpenters from Moscow, Idaho or the retired couple from Riverside CA and their sons. Basically, if it floats it fishes. Three men in a tub? Yea, they’re probably team number 63 from New Mexico. I’ve seen pangas do as well as mega-sportfishers. Folks with little or no experience and not much more than department-store-fishing gear have as much fun as professional teams. Heck, last year, the tournament was won by a great guy from the mid-west who had NEVER fished in the ocean. In fact, he beat the field using a single-speed off-the-shelf-reel and a rental rod! You gotta love that. It’s not that hard to win money in the various categories and, even if they don’t get a big check, they still go home with all kinds of gear, swag and giveways not to mention big smiles! The really neat thing is that we see the same folks year-after-year. It’s much like a gathering of tribes! And everyone knows each other. There’s only about 10 of our Western Outdoor New staff members and then there’s the great group of regular sponsors that just jump right in and party and hang with everyone. There are very few strangers and no one stays an outsider for long! Everyone knows the “Redneck Hillbilly” fishing team and the “Borracho Lizards” and “Shut-Up-And-Fish” team. I can always tell the cowboy team from Wyoming when they start yelling. The “San Diego Blasters” have their own set of cheers and there’s another team that will take any opportunity to start singing “Sweet Home Alabama” by Lynrd Skynard at the top of their lungs. Even tho’ they’re from Arizona. Go figure. In some ways, the actual fishing tournament seems to just be a vehicle by which we throw this huge 5-day party for 1000 people. It’s an excuse for a kick up their heels…or flip-flops! It’s like letting the “Gypsies in the Palace!” Yea, lock the liquor cabinet and don’t expect the lawn to get mowed. I sometimes think the tuna fishing is “something to do in the daytime” and that more people look forward to the huge fiestas we throw each night for the tournament with live music; great food; gear giveaways; contests; and copious consumption of massive amounts of adult beverages…all under the fall skies of great Cabo San Lucas evenings. But, yes, there’s still the matter of fishing! This is the time of year when many of the “Big Mo’” cow tuna take up residence around Cabo San Lucas. We’re talking the 100-300 pound beasts that prowl the sea where the land ends and can bust up tackle and anglers in quick succession. At last year’s tournament, I could not remember a year when we weighed so many fish over 100 pounds. And with each “oooh” and “ahhhh” and click of camera shutters, the excitement builds as each fish is hoisted and charted and each team poses with the Corona Girls. When you’re up at the scales, everyone is a winner. And there’s is an electricity as the big fish is put into a cart and hauled to the weigh station. And there’s a hush and the anticipation grows heavy. And the silence as the fish it pulled up. And…and…and…tension…the rope groans beneath the monster tuna. And the weight is announced. Then a yell! Cheers erupt! Victorious fists pump the air! High-fives! Back slapping! Cameras flash! The tribes go wild. It’s pandemonium on the docks. It’s pretty special. Wish you were here! Jonathan Roldan has been writing the Baja Column in Western Outdoor News since 2004. Along with his wife, Jill, they own and run the Tailhunter International Fishing Fleet in La Paz, Baja, Mexico www.tailhunter-international.com. They also run their Tailhunter Restaurant Bar on the famous La Paz malecon waterfront. If you’d like to contact him directly, his e-mail is riplipboy@tailhunter-international.com or drop by the restaurant to say hi!